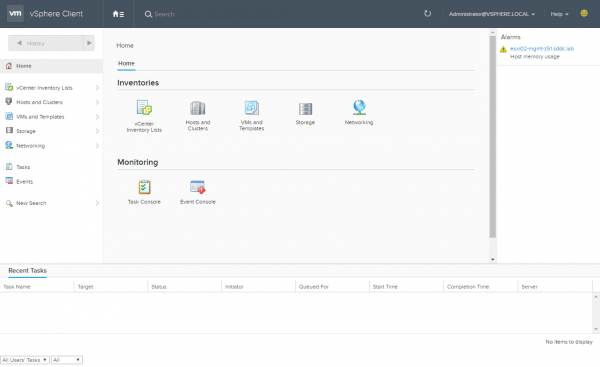 VMware introduced the vSphere Web Client with vSphere 5.0 release. Initially not aligned to the C# Client in terms of features, its current version allows to manage every aspects of our products and is very similar in look and feel to the former legacy client. 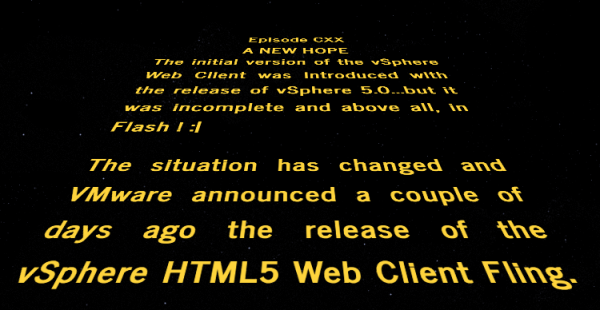 The decision to use Flash was made a long time ago in a galaxy far far away, before HTML5 was ready (HTML5 was finalised in 2014). Recommended browsers: Chrome, Firefox, IE11. I will not come back on deployment and configuration as clear instructions can be found on the Fling page. 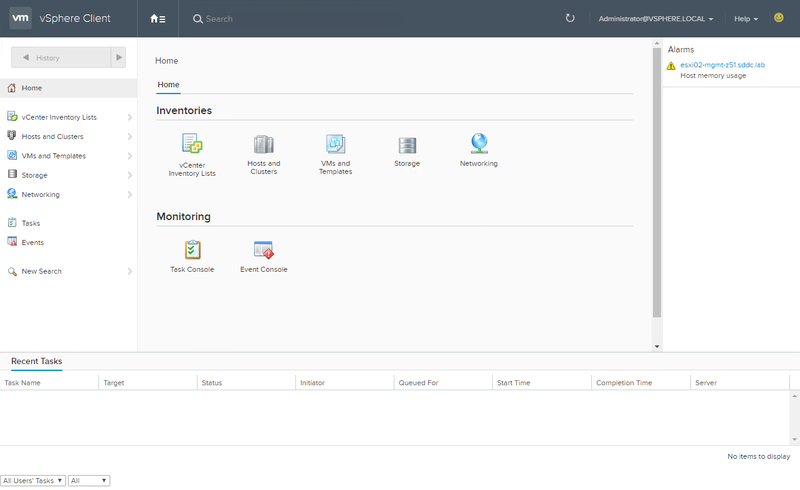 As usual, there are always lunatics and I have seen criticisms such as “VMware introduced a new SPOF” or also “Why not have it integrated into vCenter, it is so wrong to have it on a separated virtual appliance” on social medias. Wait…isn’t the HTML5 Client only an interface? 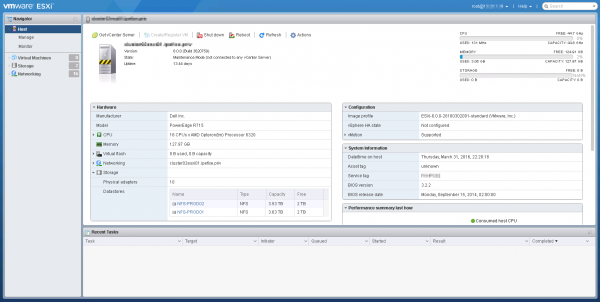 If this interface is down, you can always use vSphere Web Client…or PowerCLI…or API. 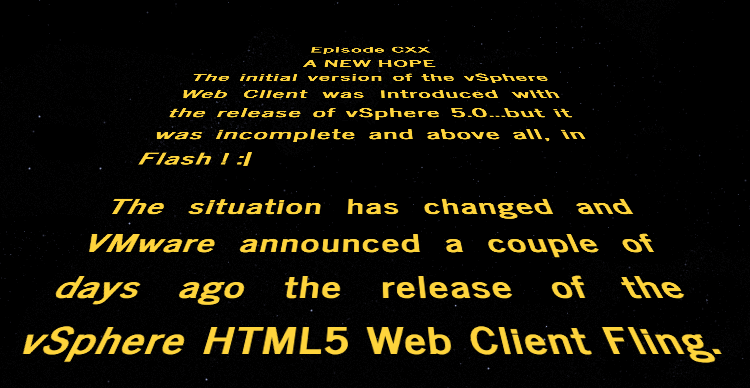 And without being a prophet, I think we have good chances to have it integrated in a future vSphere release. 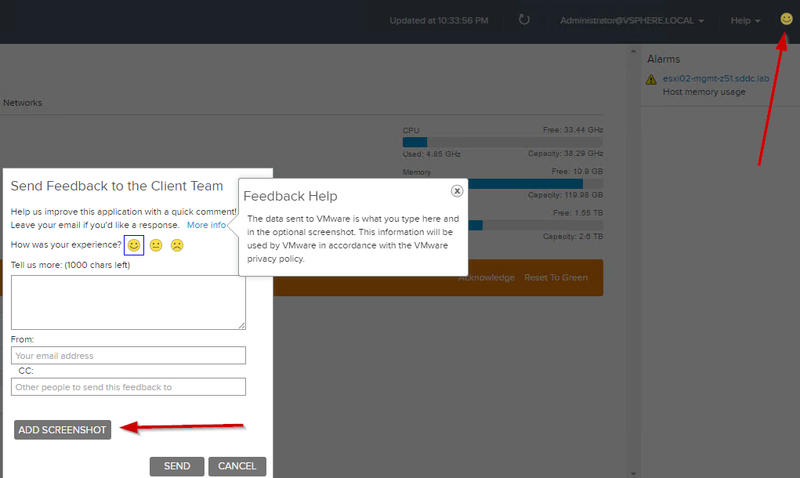 This Fling is only a technology preview to share VMware vision on the subject and to gather feedback. For those who are unaware, there was a similar initiative to create an HTML5 interface for vSphere hosts, the Embedded Host Client (a.k.a. EHC). Initially only available as a VIB to install, the EHC is now embedded in ESXi since version 6.0 U2. Be aware that this Fling is only a first iteration and is currently not complete but will be regularly updated to provide new features and address issues. A Web Client is huge in terms of capabilities and it will take some time before having features parity with the current one. This Fling is only the first iteration and will be improved based on the various feedbacks. However, if it takes the same path as the Embedded Host Client, things will move fast. 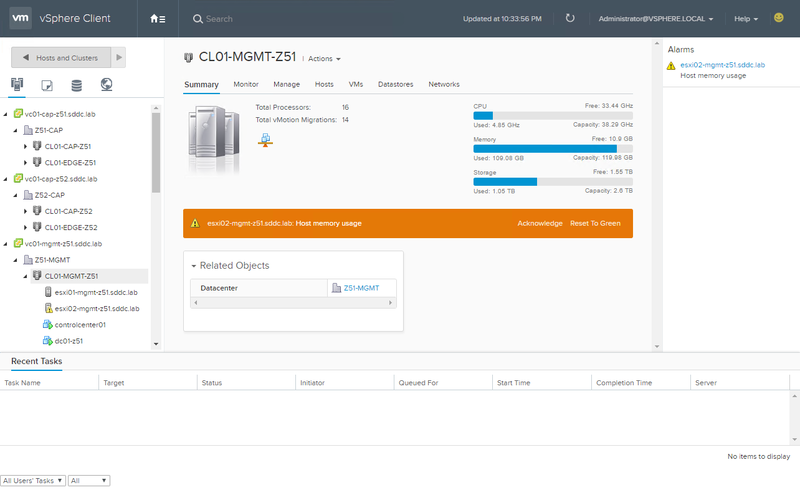 Indeed, after 6 releases in less than 8 months (initial release was in August 2015), EHC is now very close to the legacy vSphere C# client in terms of features. I like the approach of making this HTML5 Client available to the community as a Fling during its development to gather a maximum of constructive feedbacks, the final result will be awesome!